Brand new design brought to you by Stella Crafts. This box is easy to make, this requires double sided tape applied to one tab. simply fold up the bottom close and close the lid with ribbon - WE DON'T supply the ribbon. The boxes are supplied flat packed for home assembly. If you dont have any double sided tape at home we recommend the double sided red liner tape 6mm which is available on a separate listing in our shop. 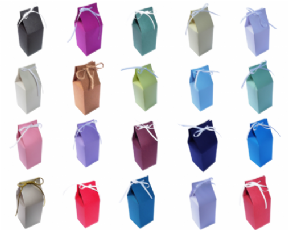 The boxes are available in our usual colour range and quantity selection from the drop down menus. The boxes can also be used for all occasions including birthdays, Christmas parties, christening, conferences and much more.